Once upon a time, a small boy asked famed architect Frank Lloyd Wright to design a house for his dog. Wright complied, sending plans for a complicated triangular structure. The boy and his father eventually put the house together after several years, but when their pet passed away, the house was scrapped. 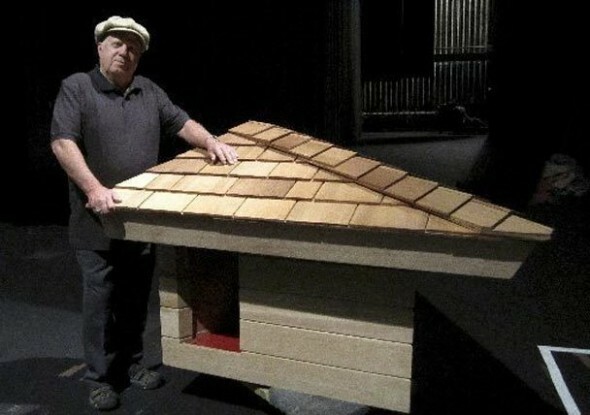 Now 68 years old, Jim Berger has built his boyhood Frank Lloyd Wright dog house again for use in a documentary about the architect and hopefully for final installation in a museum. This entry was posted on Tuesday, March 13th, 2012 at 1:45 PM. It is filed under Blog. You can follow any responses to this entry through the RSS 2.0 feed.